What Makes a Good Math Curriculum? I remember Annie Fetter doing some tweeting of questions from a pre-service teacher a while back, so it was neat to see it come together in this Ignite. I’ve definitely come around to her “No” for the question “Can you do a DIY math curriculum?” even though my response to her tweet was a “yes, but…” She made an excellent case in this Ignite that teachers’ time should be spent focusing on classroom implementation and collaborating with colleagues. I always get warm fuzzies when I think about Max Ray being out there working with teachers to improve practice. His talk focused on strategies for getting teachers to shift their practice. I especially like #2 on talking about decision-making and not decisions. That focus on how/why a teacher chose a certain path feels like it would be very productive. This is the first place in my notes I see ‘language’ cropping up explicitly, but definitely not the last. Laurel Pollard‘s elementary students are so fortunate to have a teacher like her who has such a love of mathematics. Her session was on why she calls her students ‘mathematicians’. Laurel’s 3rd point, that mathematicians are people who share math ideas, is a classroom norm that she consciously develops in her students. She also shared some interactions her student’s have had with mentors via the Math Forum’s Problems of the Week (PoWs). Jim Dooley worked the classic fishing metaphor in his talk on building culture in Delaware. Teacher leadership is something that I think a lot about so it’s great to hear about locally-lead efforts going well. Norma Gordon‘s talk was so visually interesting I barely wrote anything down! Thinking about communication with students and how the digital age affects our choices was a theme here and worth thinking about. John W. Staley evoked some powerful imagery with his call for leadership. As we move forward in our careers and times change, it’s good to ask oneself if we’re in the crowd, on the sidelines waiting to play, or in the game itself. For myself, I’m in different categories depending on the topic, which is as it should be since I’m only one person. I think we should all have our hills that we will take our stand on and figure out what hills and how to best defend/promote them is a hard skill to learn and takes mentorship. Since John is the President of NCSM, however, he’s in a good position to make that mentorship happen for teachers looking to affect change. When Does 2 + 7 + 8 = 1? Grace Kelemanik‘s talk focused on a taxonomy of sorts for the Practice Standards. I’ve seen a few different arrangements of the SMP’s and I like the mental work of thinking of one practice could support another. My takeaway was on how getting students to engage in MP’s 2, 7, and 8 we can get them Persevere in Problem solving, which is a notion I can get behind. My one worry with her ‘supporting roles’ metaphor is on teacher’s seeing more practices than are actually present, which is a thought that pinged my radar actively twice this conference from @mathednet and @wgmccallum. What Needs to Change in Math Education? Carl Oliver‘s talk made a great point on how the fears we have can drive commitments we make that are not necessarily commitments we want to have in our classroom practices. 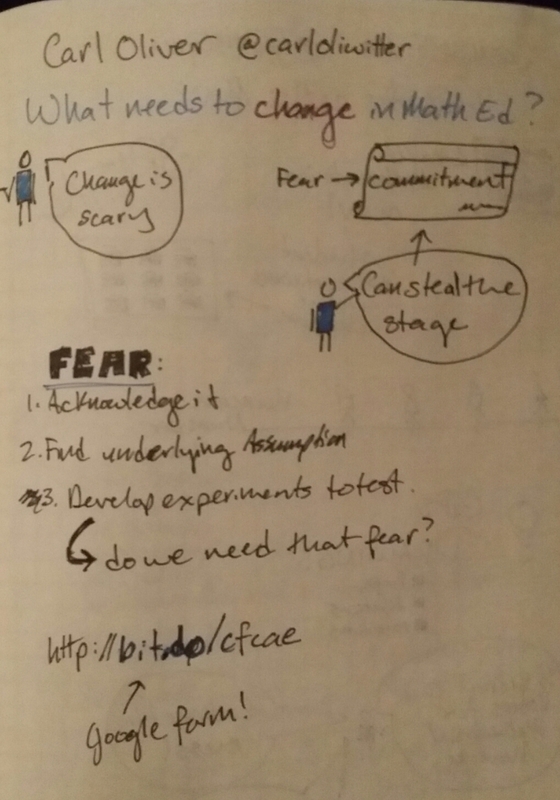 “Change is scary” indeed, and I think fear of trying something new in the classroom is one that a lot of teachers have, but there is this underlying assumption in that fear that we can’t pull it off and that means we’re making a commitment to not put ourselves in a place where we could bomb a lesson. And that means we’re going to teach the way we were taught. I’ve never thought about fear this way and I missed writing down the book that Carl said sparked his thinking on this. I highly recommend you head over to the google form and read through the questions at the very list. I think the process of filling that form out is an excellent exercise for thinking through one’s underlying assumptions. I am a big fan of developing spatial sense and getting movement into the math classroom so it was neat to see what Jasmine Y. Ma had to show. Her photos of the Human Number Line and GPS drawings were really neat and her call to “Embrace the Mess!” is one I can totally get behind. Check out some of her stuff over on her website. 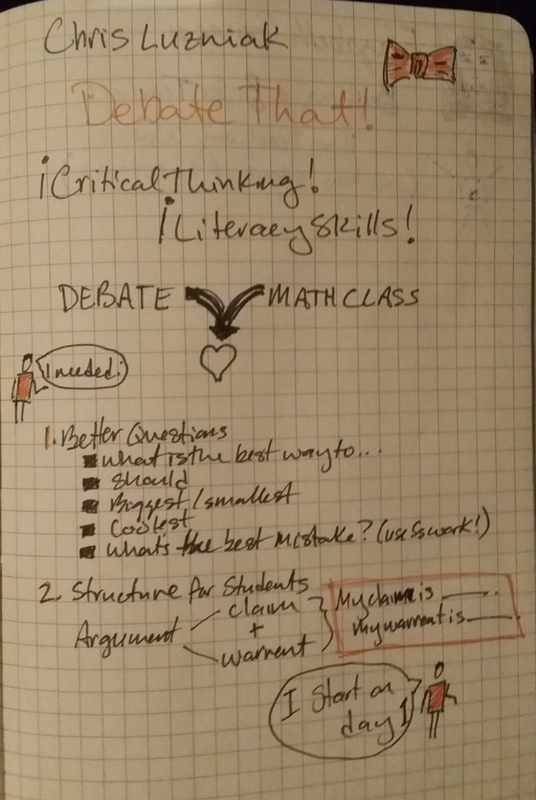 The incomparable Chris Luzniak closed us out sharing how he incorporated debate into his math classroom. The potential for critical thinking and bringing in ELA skills is huge and I love that there is video of Chris in the classroom out there for the world to see. The bulleted list has some question types he likes to use to get discussion going and I think they are great even if setting up a formal debate structure in your classroom isn’t something that fits your teaching practice. And lastly, to see a stellar sketchnote for the whole thing, check out this one by Karen McPherson. I hope to one day have such great use of color and shape as she does!